Another crowded, smoke-filled room with forty or so people gathered around another long table with a projector at the end throw up a picture of a map on a too-small screen. From my position, the whiny fan on the aged Canon digital projector obscures the voices coming from the other end of the long, rectangular room. Today at the command center, many of the provincial players from nearby Iraqi Security Forces (ISF) gathered at our weekly meeting. Normally used to discuss the previous weeks SIGACTS, or Significant Actions, the agenda from this week was to highlight the impact of the ISF ongoing turf wars. Now, these are not turf wars where one group encroaches on the territory of another. The problem here is ISF units in our areas are hesitant to engage outside of their given Area of Responsibility. The cloud hanging over the table is the assassination of another influential sheik the previous night. The enemy, conveniently dubbed as al Quada, uses a policy to alienate the highly successful Sons of Iraq contracted-militias from ISF and Coalition Forces. The strategy is clear; alienate the people from the Government of Iraq and Coalition Forces by attacking a linchpin of Coalition support. Areas of Operations, or Areas of Responsibility, are pieces of land handed to us by our higher headquarters with the intent of preventing conflicting operations between friendly forces. In a perfect world, all the Areas would bump up against each other to provide maximum coverage to throughout the province. However, this is not a perfect world, and the Areas do not bump up against each other. As each representative from the Iraqi Army, various Iraqi Police departments, and the National Police go to the map and draw their Areas, it become apparent that there are 1) a lot of overlapping areas and 2) a lot of gaps with no one claiming responsibility. Not surprisingly, the murder of the influential sheik happened in one of these gaps. Also not surprising, is the use of these areas as enemy safe havens. Overlapping areas of responsibility appear to be in cities and on major highways. The gaps and enemy safe havens appear among rural areas and agricultural communities, well off the beaten path and difficult to access with the Coalition new, larger IED-resistant MRAP vehicles. By looking at reports of enemy activity and traffic through the province, we see that our enemy knows where the gaps are and is exploiting them to his advantage. This is changing. All the professionals around the table now look at the map and see themselves hamstrung by poorly coordinated lines arbitrarily drawn on a map without much consideration for history or the enemy. The Coalition Force commander quoted Sun Tzu when he called this first step, "seeing ourselves." Our next step is to take our maps and gaps and identify the enemy, his patterns, and his networks. This is called, "seeing the enemy." This includes sharing intelligence in a country where mishandling your 'source' could get someone killed. That portion will probably prove difficult given the turbulent history of distrust between the different Iraqi Security Force entities. Sharing will be a challenge. We'll cross that bridge when we get there. We sat in a long conference room staring at a projection of our counterparts' planned mission. It was a brigade level sweep of a nearby area, plagues of late by an increase in violence and insurgency. A few weeks back, insurgents targeted and successfully assassinated a local Sheik and his family with a roadside bomb. Two weeks later, gunfire killed his chosen successor. The pattern was clear: assassinate influential Sheiks with ties to the Coalition and the Sons of Iraq. Reestablish a stronghold for the insurgency in a rural area where Coalition Forces rarely travel. Different interpretations of events followed and different courses of action developed. The Coalition was in the middle of facilitating reconciliation between the area’s three tribes. Meanwhile, the Iraqi Army planned a large-scale operation intending to break the back of an insurgency operating in the area with impunity. The Coalition plan relied on partnership and finesse. The Iraqi Army’s was the proverbial hammer to the nail. Both plans were good. Tribal reconciliation would address many related problems: governance, security, and infrastructure. A military operation would show insurgents that although the Coalition would not chase them deep into rural areas, the Iraqi Army would. The coalition aimed to gain support to key leaders in the area. The Iraqi Army plan would take support directly to the populace. This mission jeopardizes the bigger picture. We will not stand in your way, but if you go, this time you go it alone. Our Iraqi counterparts conducted their final back briefs, rehearsals, lined up their vehicles, and prepared to move out. So where does that leave our Military Transition Team? We are the advisors to our Iraqi Army counterparts. This week we put hundreds of man-hours into assisting their planning efforts. It was a good plan based on solid intelligence and backed up with many, many arrest warrants. As Combat Advisors we build credibility and rapport by ‘being there.’ Whatever our counterparts plan and execute, we are alongside them throughout. When they go to fight, we fight alongside them. As Coalition members, we bring and coordinate the ‘force multipliers’ ranging from additional surveillance to attack helicopters to additional U.S. ground forces. Most important, we are also the conduit to Coalition Medical Evacuation, or MEDEVAC, the air evacuation assets and Coalition Force hospitals that provide the countries best chance for the critically wounded. Many Iraqi Soldiers, or “Jundi,” survive horrific battlefield injuries because of Coalition MEDEVAC brought by their Combat Advisors. As a Soldier and Combat Advisor, I wanted and needed to be there with my Iraqi brothers. As a member of the U.S. Army and Coalition Forces, I understood the bigger picture and advised them against conducting the operation. We were stuck in a hard place between supporting our counterpart’s tactical mission and supporting the Coalition Forces strategic campaign. In the end, we voted the only remaining way we could, with our presence. Our boss informed his counterpart, an Iraqi General Officer, that when the unit deployed a few short hours later, his combat advisors and all we bring to the table, would not be in his order of march. In this business, we call it the “Silver Bullet,” something you can only fire once. It was the last option, and not a pretty one. 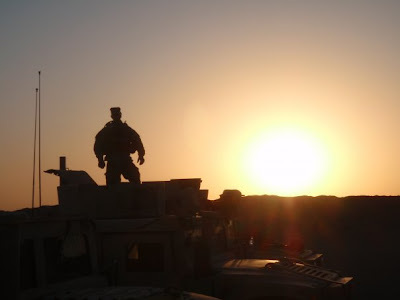 By sending them off alone, we placed at risk all the credibility we built as Combat Advisor by “being there.” It was the best choice among a collection of good options. Sacrificing the credibility and effectiveness of a ten-man team for the overall security and stability of a region is a small price to pay. With that, we went to bed and waited for Iraqi Army to drive off into the night, hoping they all return in one piece. Last week, my team travelled to Tikrit to sit in on a transition meeting between the Iraqi Army, Coalition Forces and contractors representing almost 10,000 Sons of Iraq contractors from our province. On March 1, the process for transition supervision and responsibility for Sons of Iraq (SOI) formally begins in the Salah ah Din province. There are over 2,000 alone in my area, and over the next several months, the Prime Minister ordered all to transition to the employ of either the Ministry of Defense or Interior (Army or Police) or to a position somewhere with the Government of Iraq. So who are these Sons of Iraq guys? Listening to some, you would believe that a good deal of these individuals where the guys we fought pre-Surge, back in 2005-2006. There is a good deal of truth to that. For young men trying to put food on the table for their family, they based their roles as insurgents almost as much on economic opportunity as they did idealism. Now they are beneficiaries of Iraq’s National Reconciliation Program. Formerly, the insurgents and terrorists were among the few available employers to young Iraqi males. Enter the Surge and the Sons of Iraq. Part of any decent counterinsurgency, is figuring out how to convince insurgents to lay down their arms and take up jobs. The brilliance of the Sons of Iraq is that now you let them to do both. Hundreds of thousands of Sons of Iraq took their weapons and under the guidance and supervision of Coalition Forces, boldly stepped into their new roles of providing security to the people of Iraq. Many of them, who were part of the problem, became part of the solution. Together, they provided security coverage far into areas of Iraq where Coalition Forces and the Iraqi Army did not. The fought insurgents bravely, sometimes in spite of themselves, and ultimately many sacrificed their lives in the name of the Iraqi People. Not all SoI were part of the insurgency that swept across Iraq. Many are hard working Iraqis taking advantage of classic economic theory. We had a demand for security, many of those young men stepped in to fill it. Some came from the other side as part of reconciliation, but most were just looking for jobs. Back to this week, many were represented in that room in Tikrit. Their sheiks were there to receive a briefing from the Iraqi Division Commander and provincial Governor on the details of the transfer. When they opened the floor to questions, there were many: Complaints of inconsistent pay; unfulfilled promises from Coalition Forces; logistical support; compensation for fallen SoI. The sheiks asked hard questions and unfortunately, there were few answers. Cameras lined both sides of the meeting room. Interviews conducted after the meeting indicated high degrees of both hope and pessimism. There is no question that the SoI were part of the formula that greatly reduced the violence. Some were argue that they were THE critical part. The mission now is transitioning them over the Iraqi military control. It will not be easy. Our Iraqi counterparts have difficulty dealing with their own pay and administration. Now we will gradually load thousands of additional SoI and their related issues on the shoulders of the Iraqi Army. Our counterparts appear to be up to the challenge. In the last week, they worked late into the night to come up with a plan to focuses on integrating control of the Sons of Iraq into our brigade, while emphasizing the treatment of SoI with dignity and respect. The latter is a difficult task, not so long ago many of the IA and SoI were on opposite lines of the counterinsurgency campaign. Now, the leadership see the SoI as an extension of their operational reach, capable of providing additional security and intelligence to the Iraqi Army. This will be our most important mission over the next several months. So far, all is well. Personally, I want to see all the SoI integrated into their new positions within the Iraqi Security Forces or government employ. Count me in the crowd that does not want to see them cross back over to the other side. The Army is not all Kevlar and testosterone. Over the years I have come to the realization that people, not tanks and helicopters, make the Army go. Of course, it's the same as in the civilian world. You have to work with people in order to accomplish your objectives. Over the last week, we had two objectives. First, we had to get out into our battle space and find where we fit in the grand scheme of things. Just tackling the weekly rhythm alone was a daunting task. There were meetings scattered all over the calendar and the map. We quickly realized was that with a small, geographically isolated team you could not get everywhere for every meeting. If we did, we would spend all our time on the road going to meetings rather than performing our primary duty: advising an Iraqi Infantry Brigade. That process is still ongoing. We're whittling the large list of meetings down to a few. We're figuring out where we need to plug in to maximize our effects. It'll be another couple of weeks, but it should pay off for us in the long run. The important part is trying to find the right forum for connection our Iraqi and Coalition counterparts. That's the key to success and will require additional work. Our other objective was to get out and work on relationships. Before coming here, we were told that our primary problem would be lack of support from coalition partners In other words, don't bother asking for help because none will come. The reality we discovered was very different. Coalition units have bent over backwards to provide the support needed for us to execute our mission. The primary difference between what I'll categorize as 'then-and-now' is simply personalities. We've made it a point of emphasis to get out there and shake hands with units throughout our area of operations. Already, the payoff is huge. It is yet another reminder that an e-mail is never as good as a phone call or a handshake. Oh, and that you get more with sugar than salt. For the past week, out RIP/TOA focused on integrating our new team with our Iraqi counterparts and preparing for the 31 January Provincial Elections. The Iraqi and Coalition Forces managed to exceed all expectations in providing safe voting locations for the Iraqi people to come and practice their freedoms. For weeks in the region, enemy insurgent activity has been on the decline. There were two schools of thought on why. First, pressure on the insurgents is intense. In the weeks up to the elections Iraqi and Coalition Forces continually applied pressure throughout our region. Coalition patrols and a huge amount of checkpoints run by the Iraqi Army and Sons of Iraq denied insurgents freedom of movement throughout the sector. Second, most of our experts predicted that the downturn in violence was a tactic by insurgents to save up for large, attention getting strikes against the coalition and populace on election day. It made sense. Given the pressure placed on insurgent by Coalition and Iraqi forces, the natural assumption was that insurgent would be desperate for attention and go for the big election day hit. What was my team's role in all this? After all, we were only on the ground for one week. This time, we were the observers. We integrated ourselves with our Iraqi counterparts. We checked and double checked their preparations. We coordinated with our Coalition counterparts throughout the region to ensure that everyone was on the same sheet of music. When election day came, we watched, and we prayed. Nothing happened. There were reports of a few small incidents regarding celebratory gunfire, but on whole, it was a rather quiet day. As the clock ticked, we bit our lip and held on. Everyone waited by the radio, waiting for a report from a polling station of a monstrous attack. Coalition and Iraqi Quick Reaction Forces stood by, ready to handle the worst. The worst never came. The Iraqi people again pointed their signature ink-dipped fingers in the air, again showing a sign of victory and defiance. We still hold our breath, waiting for that big, attention-grabbing attack. Waiting for someone to break the quiet. When it comes, our Iraqi counterparts are ready, and we will be there alongside them. Again, yesterday, was a great day. Let's see, where are we these days? Currently the team and I are positioned at Camp Buerhing in Kuwait undergoing additional training prior to moving north into Iraq. So far we've completed engagement skills training, weapon sight verification, a small amout of language. Today we received familiarization training on the new MRAP vehicle. I won't try to spell it out, it's big armored troop vehicle and sits well over 10 feet high. Google for more information if you want to know more about the MRAP. We're still adjusting to the time and region change. Even after a week in country, we find ourselves waking up at all times of the night for various reasons. Sometimes we fall back asleep, sometimes not. A few of the men in the tent are starting to get sick. The main concern is a bug spreading around. That's what you get when you cram 70 Soldiers in close proximity. At best you stay clean, wash your hands constantly, use lots of sanitizer, and hope for the best. In around a week we'll head up just north of Baghdad to continue our indoctrination training. We look forward to linking up with the team we will replace and moving to our ultimate destination at FOB O'Ryan. There we will conduct what is called a RIP/TOA, or Relief in Place/Transfer of Authority, with the current team to signify our assuming control of the ongoing mission of advising an Iraqi infantry brigade. With a week of training left here and another 10 or so days of training up north, I think it goes without saying that our team is ready to get the mission underway. We have been training for this assignment since the end of September. Among other things, I think more than anything, the team is lookinig forward to getting a little privacy. After almost four months of living is rooms full of dudes, we're happy to be moving into a facilities where everyone has their own quarters. They're called CHU's or Container Housing Units; shipping containers converted into portable apartments. They are small but for us they'll be the best thing since sliced bread. After that we can start to worry about other amenities. I have no idea what kind of communication or internet capability we will have at FOB O'Ryan, but I will make the best whatever is available in order keep everyone informed as we take over the mission.